but i need to create another connection, depending, we have 500 databases, one per store, im trying this. i tried a lot of methods, i read an lot of post here and in other pages, but i cant resolve why i getting this error, we dont want to use jndi because every connection data are stored at the master database, want to do a programatically connection, please help me dont know what to do. Looks like you've not got the Oracle driver on your class path. 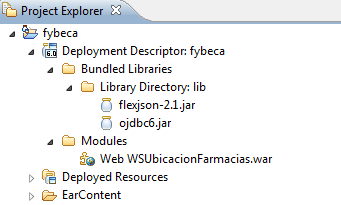 If you're developing a web app, you can put it in your WEB-INF/lib folder. How are you deploying your app? WAR, JAR, EAR? Have you created a module for your Oracle driver ? JBoss can see the Oracle classes because you told it which module they are in the <driver>...</driver> section. This doesn't mean your application can see these classes as it would not normally need to be able to do this. Therefore, you need to add a module dependency to your application in a jboss-deployment-structure.xml as described in Class Loading in AS7 which was previously suggested by David Salter. given the fact that you have allready created module which has oracle driver (jar) in it. and this "com.oracle.ojdbc6" is name of module you have created for oracle jdbc driver, it is same module you use when defining datasource and lookup it trough jndi. also you do *not* need ojdbc6.jar to be part of your application it is enough for it just to be in module you defined. in libraries put the ojdbc6.jar thanks for ur help.